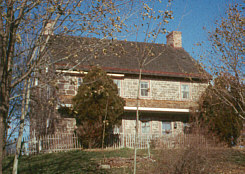 S&E Construction of Greenlane, PA was the contractor who performed the work. Project Documentation was prepared by Mark Hombaker and Debbie Vilar, June, 1994. 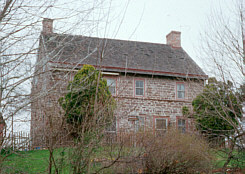 The notes were added to the photographs by Bradley S. DeForest. Reconstruction of the pent roofs on the north and south exterior walls of the Indenhofen house. Examination of the north and south exterior walls of the IndenHofen House revealed that pent roofs did exist on both the front and rear of the original section and only on the front (south) of the later addition. The current theory is that the original section was constructed with pent roofs on both the north and south facades; however, when the later addition was constructed, the pent roof was extended across the south side but not added on the north side. 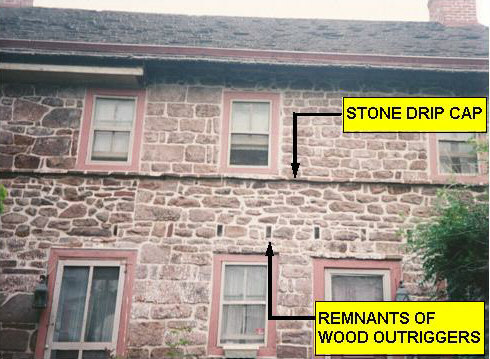 Evidence of this exists in the fact that remnants of the outriggers (sawn flush to the exterior walls when the pent roofs were removed) were found along the entire length of the south wall, incorporating the original and later additions. A drip cap also exists along the entire length of the south wall. 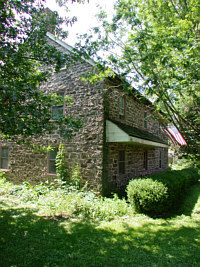 While outriggers and a drip cap exist on the north, or rear, wall of the original section, no evidence could be found to suggest that the pent roof had been extended across the north wall of the later addition. There is apparently a difference in the original framing of the south pent roof between the original section and later addition. 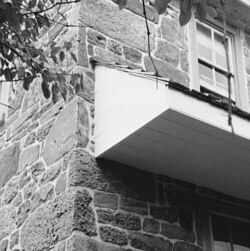 While the pent roof on the original section was supported by outriggers spaced roughly two feet apart, the pent roof extended across the south wall of the later addition was supported by only three outriggers - one on each end and one in the middle. Before reconstruction of the pent roofs was initiated, there was some discussion as to whether the pent roofs would have had an open or enclosed soffit. The decision was made to construct the pent roofs with an enclosed soffit. This decision was made based on several factors. 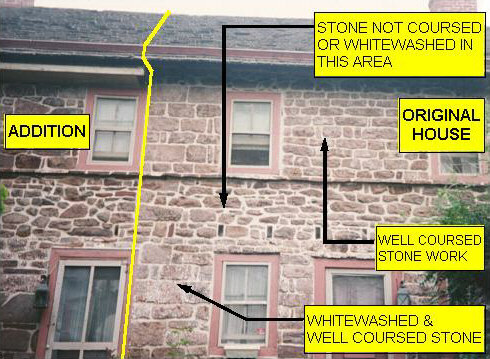 First, it appears that the south (front) wall was whitewashed just on the first floor. Interestingly, the remnants of this whitewash end approximately one inch below the exposed faces of the outriggers. The fact that the whitewash does not extend up between the outriggers suggests that this area was inaccessible due to an enclosed soffit. A second reason for the enclosed soffit is in the masonry. While the south wall was constructed of rather well coursed stone, the area encompassed by the pent roof was not coursed. The north, or rear, wall was perhaps not as well coursed but there was a definite difference again between what was exposed and what the pent roof would have covered. The differences in the coursing indicates that the pent roofs would have had an enclosed soffit thus hiding the uncoursed masonry from sight. Lastly, an enclosed soffit was desirable from a maintenance point of view. An open soffit would certainly provide suitable living quarters for birds, bees, etc. and cause continual maintenance problems. An enclosed soffit would prevent the pent roofs from becoming an attractive nesting place.